The types of flies the average individuals crosses paths with on a daily basis, from your basic house fly to mosquitoes and gnats, are defined by having two wings. In fact, it’s the defining feature of the extra large order Diptera. With over one hundred and fifty thousand Diptera species, divided into over one hundred families, a proper categorization of different types of flies would necessarily be an encyclopedic endeavor. A less systemic approach to Diptera often begins by thinking about them in terms of their relationship to humans. Many people, for example, want to know about poisonous flies. The quick answer to poisonous fly questions is, there are no poisonous flies. It’s more accurate to think of flies as disease spreading pests that pick up bacteria and viruses from many different sources, and then spread those bacteria and viruses during the course of their every day existence. Mosquito transmission of West Nile virus for example, presents an ongoing challenge to public health officials. Notwithstanding pest label, many fly families can be considered beneficial insects that pollinate plants and prey on insect pests. This brief presentation provides pictures and descriptions of some basic fly types to help answer beginning fly identification questions. Since you, the reader, are interested in types of flies, statistics suggest it’s probably because of house flies. Most types of house flies get a big yuck response. 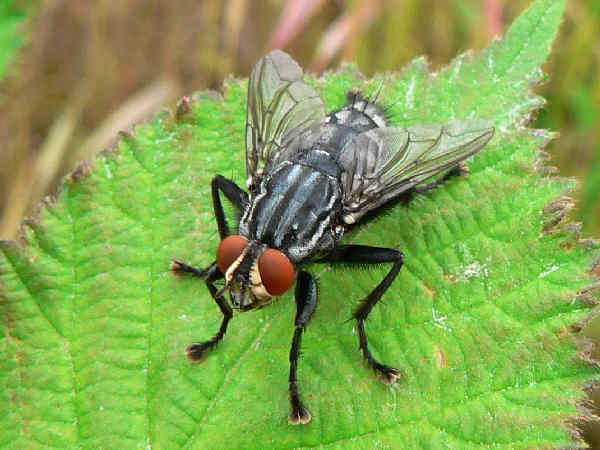 Informally the term house fly often applies informally to any fly found inside the house, and depending on the locations and situation, a handful of fly families are happy to call the average residence home. When you think yuck, house flies, consider the case of the drain fly. They’re a family (Psychodidae) of very small, moth looking flies that find life in sewer sludge along with life in unclean kitchen pipes. Their larvae actually thrive in such an environment. Cleaning the kitchen pipes with an over the counter drain cleaner to remove the larval food source is the easiest and quickest to solve any drain fly problem. Formally, the term house fly refer to species in the Family Muscidae. Identifying any Muscidae housefly can be as easy as getting out a magnifying glass and looking for the feathery antennae. They are closely related to dung flies (Family Scathophagidae) and root-maggot flies (Family Anthomyiidae), and telling them apart involves close examination of wing patterns and other physical traits. Regardless of family and species differences, basic health and sanitation reasons explain the importance of identifying different types of house flies. 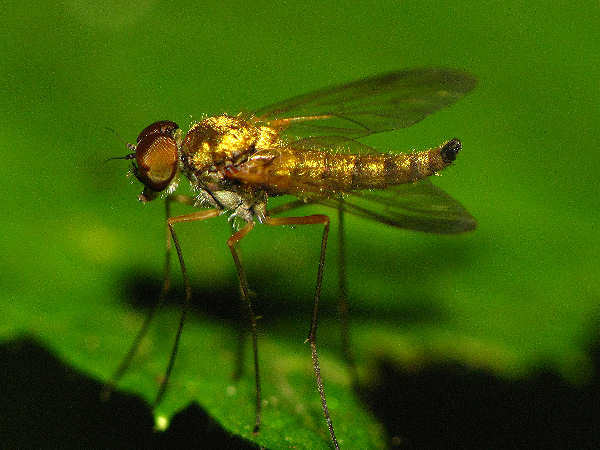 Fly reproduction follows basic insect reproduction. They lay eggs that develop into larvae, or the more common term maggots. Keeping a healthy and sanitary, fly free house promotes a healthy family, and for practical reasons, keeps the family and pet food being maggot free. House flies are definitely the types of flies no one wants to see. What exactly are house flies? Well, a few fly families, blow flies, flesh flies and tachinids look similar and share an affinity for living in residential areas. Apart from the unplesentness of their presence, these flies generally do not present a medical risks to humans. 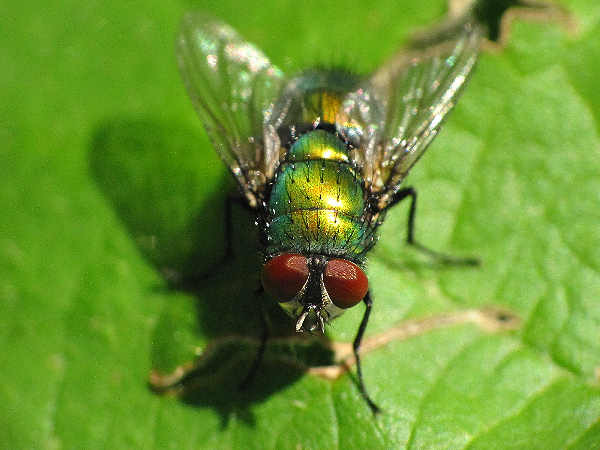 Blow flies (family Calliphoridae) or Greenbottle/Bluebottle flies can easily be identified by their metallic colors. They mostly feed on dead animals and they are present year round in most residential settings, including urban settings. Flesh Flies (Sarcophagidae family) are named for their larval food source. They are common flies, with close to four hundred different species found in the United States. The red eyes, black stripes on the thorax and checkered body are characteristic of species. Additionally, some common house flies bite, along with spreading disease. No doubt about it, biting flies ranks among the most annoying and problematic of all the dipteria species. 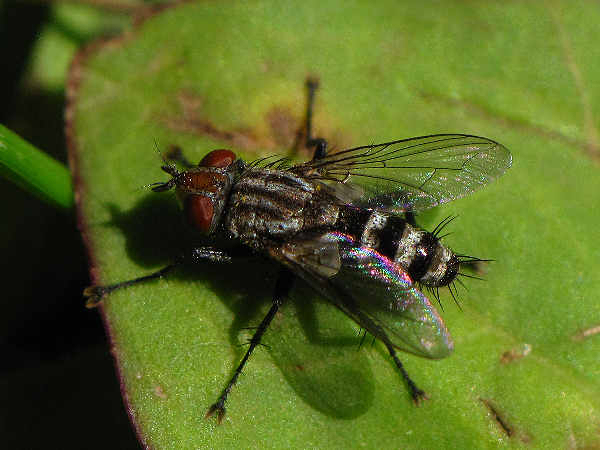 With the exception of the polar regions, many types of flies get labeled as medical pests because their bites transmit diseases. The tsetse fly, for example, a native African family of flies, are known for transmitting parasites that cause sleeping sickness. Mosquitoes rank as the biting fly of most concern in and around the house. While many common species tend not to transmit diseases, their swarming and biting practices can ruin the day of any person not prepared with bug spray to fend them off. Virus transmitting species, such as those that transmit the Zika and West Nile viruses for example, present an ongoing challenge to public health officials. Mosquito control in residential areas can often be effectively implements by removing any standing pools of water, thereby preventing mosquito breeding. Sand Flies, Black Flies, Snipe Flies, Sand Flies and Biting Midge Flies tend to be regional pests. Florida, for example, has problems with sand flies. Colorado, on the other hand, has problems with black flies. Snipe flies (family Rhagionidae) often live near wooded areas with water sources. Most are labeled as insect predators and a few species are biting pests akin to horse flies. Both biting and non-biting midge fly families exist. The biting midges, Family Ceratopogonidae, live in most of North America and go by a variety of common names such as no-see-ums, sand flies and punkies. The no-see-ums nickname is indicative of their diminutive size. The sand fly nickname is indicative of their fondness for coastal and other aquatic areas with sandy shores, although they are not related to the separate sand fly family, Phlebotomidae. The name horse fly can apply to any species in the family Tabanidae, including deer flies, or the name can be more specifically applied to flies in the genus Tabaninae. 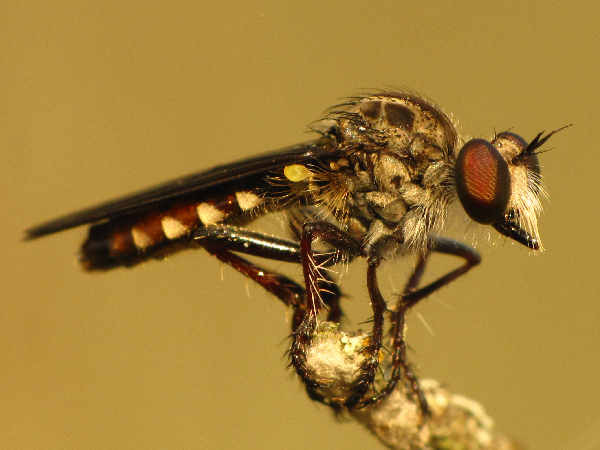 Tabaninae horse flies are known for their size, and the painful bite inflicted by females. Horseflies often live near water environments, where their larvae feed and grow on the local insects and small fish. Thinking habitat suggests that North American horsefly populations increase in the Southeast and decrease in the Southwest. Adults can grow over an inch in length, and females feed on blood from mammals, including humans, a practice that places them into the insect pest category. 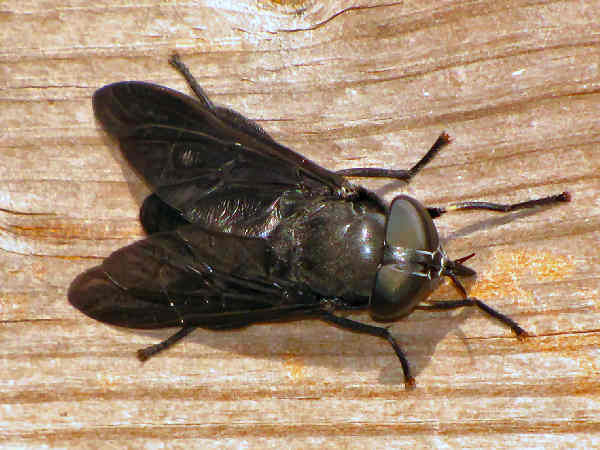 A couple dozen different horse fly species inhabit forests and fields across North America. 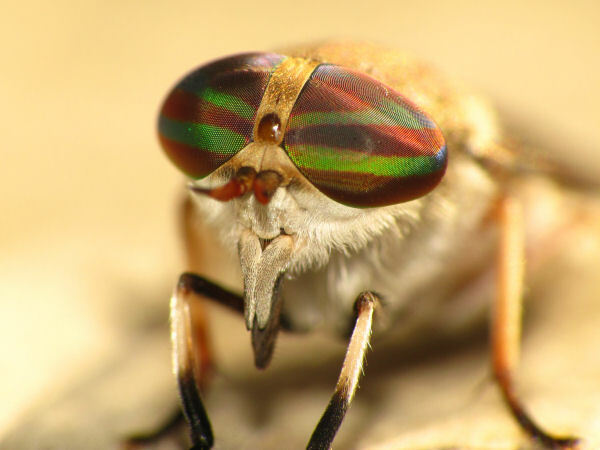 Apart from size, many horse fly species can be identified by their colorful eyes. Eye configuration can also help determine gender. The eyes of male horseflies are set close together, female horse fly eyes have a space between them. The picture at the top of the page shows a female horse fly. The picture at the top of this section shows a female black horse fly. Moving from the pests to the beneficial insect category, think bee flies. Bee mimics abound in the world of flies. 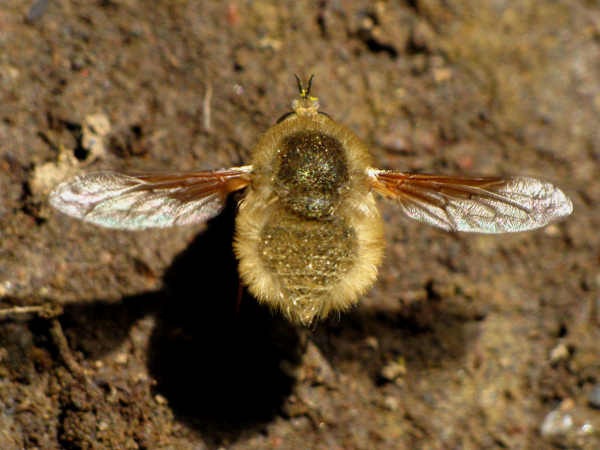 The fuzzy bodies of bee flies (family Bombyliidae), for example, explains their nickname. Like bees, many Bombyliidae are natural pollinators that nectar on flowers. However, unlike bees and wasps, Bombyliidae are not stinging or biting insects. With approximately eight hundred North American species, Bombyliidae represent a fairly robust family that divides into multiple subfamilies and genera. When it comes to beneficial flies, the flower flies or syrphid flies often get top billing because their larvae consume aphids. Like the bee flies, many are bee mimics and could easily be overlooked as flies during a casual glance at insect activity around the garden flowers. 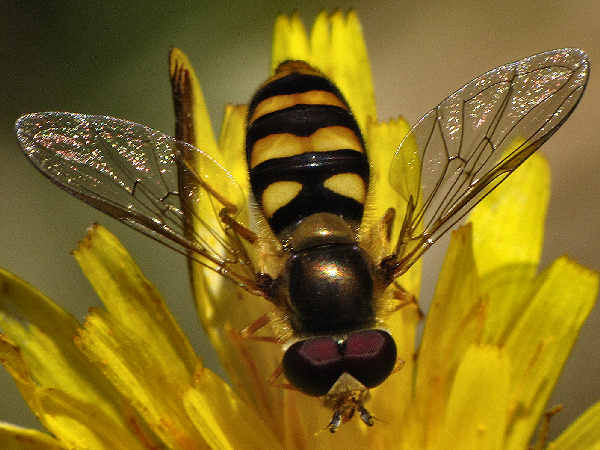 North America hosts hundreds of species in scores of genera, so it’s understandable that most people would refer to them in generic terms such as hover flies and.or flower flies. Then again, there’s always the super fly enthusiast, who collects fly species in much the same way butterfly enthusiasts collect butterfly species. One lesser known Eristalis fact… Microsoft co-founders Bill Gates and Paul Allen had Eristalis species named after them: Bill Gates’ flower fly (Eristalis gatesi); Paul Allen’s flower fly (Eristalis alleni). Maintaining a healthy flower garden involves multiple tasks, including insect identification. Pest management in the garden is often easier when the beneficial insects can be differentiated from the potential trouble makers. 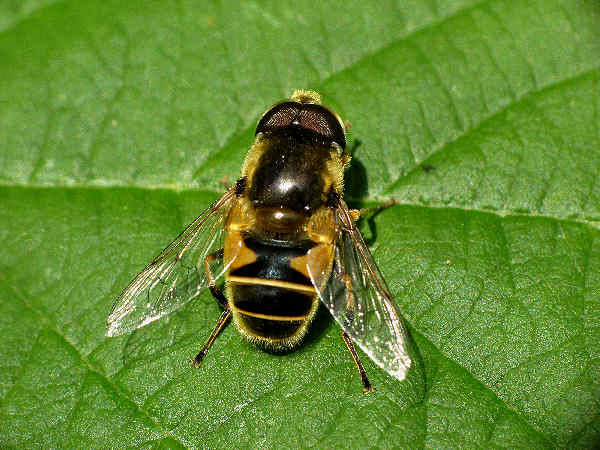 Most of the types of flower flies that appear in the garden from season to season get listed as beneficial insects. 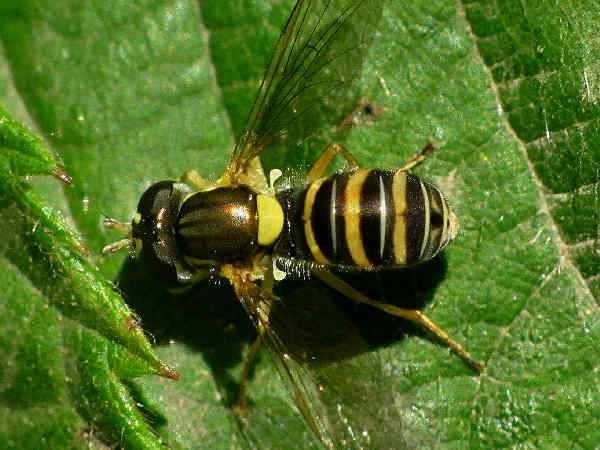 Fortunately, those same flies can be identified as members of the Syrphidae family, better known as Syrphid Flies.Their often colorful bodies resemble bees and wasps. Many species feed on aphids and other plant pests. 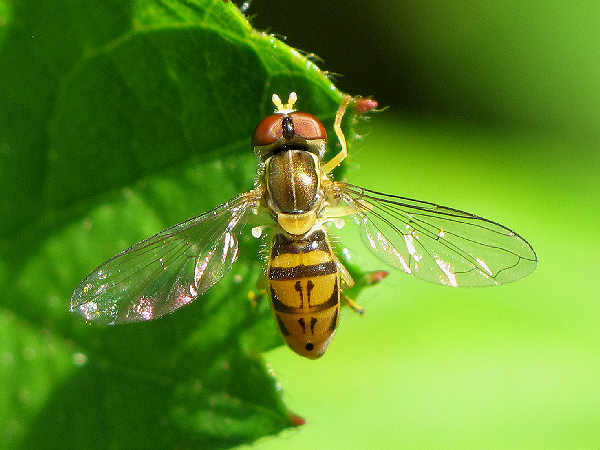 Coupled with the fact that they also perform pollination tasks, flower flies break the traditional fly mold and place them squarely in the beneficial insect category. But wait, there’s more to the story of flower flies. For example, the straight answer to the syphrid fly question, do they bite, is a resounding no. They hover and fly and nectar on flowers, and they do not bite or sting. In spite of their benefits, based on statistical trends, there’s little possibility of a surge in interest among individuals hoping to photograph all the flower files they see in the hope that one of those pictures might go viral. With those caveats in mind, the following section provides some basic rules of thumb for anyone and everyone interested in learning about flower fly identification for the garden. Here’s a general outline of the group along with pictures of representative species. Syrphid fly identification through pictures is possible, and it follows similar identification rules as other insects. Most of the flower fly groups, be they families or genera, share similar looking thoracic and abdominal patterns. With a few species, eye color and face color can be a good ID clues. Those basic identification starting points are generally good enough to get started identifying any flower fly using a picture. Sometime a picture does not provide enough information. A few species, for example, have a distinct hair pattern on the abdomen, something a camera does not always catch. In other cases, a close up of the wing pattern is needed for accuracy. Probably the easiest way to begin identifying flower flies is by dividing them into two large groups. The Eristalinae consist of approximately 500 North American species and the the Syrphini consists of approximately 300 species. The picture at the top of the page shows what is common called a drone fly, one species in the Eristalis genus. Eristalis tenax, for example, is a very common drone fly species, found throughout North America. The picture at the top of this section shows a syphrus fly, the namesake for both the family and tribe. Syrphus populations abound along both North American coasts, making them some of the most common syrphid species in high population residential areas. The gold thorax and the yellow and dark abdominal stripe pattern tend to help start the identification. A rounded and distinctly patterned abdomen provide the first ID clues for all Syrphus species Comparing and contrasting the abdominal pattern provides a next good ID step. 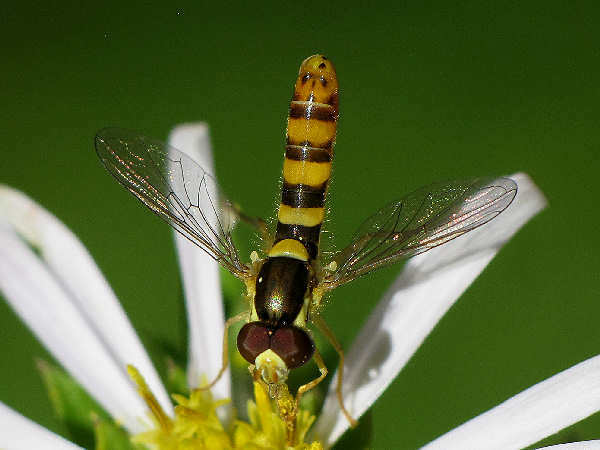 A group of flower flies can also be initially identified by their thin abdomen. Sphaerophoria, a long name for a genus of often small, thin syrphid flies, consists of some sixteen different species. The picture shows a spaerophoria species. Their body patterns change from male to female as well as among the species. 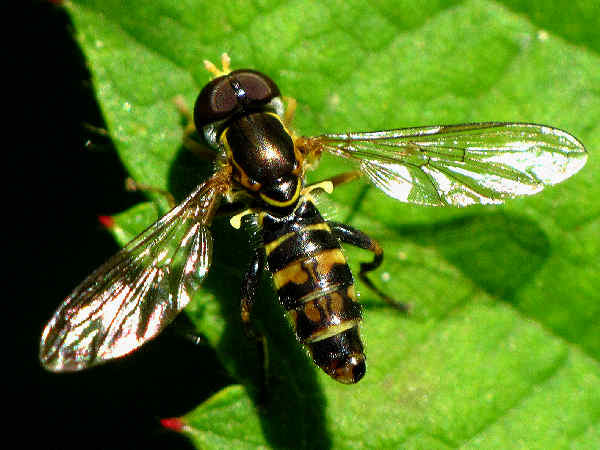 A few additional syrphid genera, Toxomerus, for example, also are characterized by their diminutive size and thin bodies. The final two pictures show some representative species from the genus They share the physical train of having vertical markings on the abdomen, rather than the horizontal stripes on the abdomen as shown in the syphrus species. 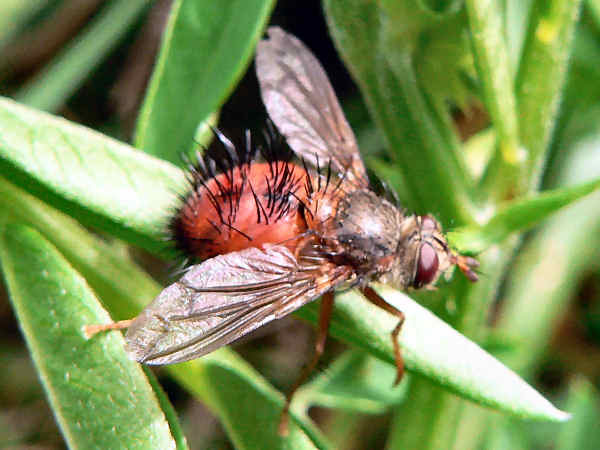 Parasitism, a reproductive strategy not typically associated with flies, serves as a key trait uniting the large and diverse fly family Tachinidae, better known as tachinid flies. With a world wide distribution of some ten thousand species, the tachinids have been loosely organized according to common parasitic strategies along with common physical traits. For example, the smallest subfamily of Tachinidae, the Phasiinae, usually get classified as the least hairy tachinids that parasitize true bugs (order Heteroptera). Entomologists generally converge on the idea that most Tachininae species, along with other tachinids, adopt a parasitic reproductive strategy that targets members of the Lepidoptera order, butterflies and moths, as the host for their larvae. Furthermore, because so many moth larvae are classified as agricultural pests, tachinids that parasitize them often get classified as beneficial insects. The use of tachinid flies to control gypsy moth infestations of forests serves as one of the most prominent examples of their use as biological control agents. The proven and potential utility of Tachinidae gives them a prominent place in present and future entomological research. North America hosts over five dozen different tachinid genera. As a rule of thumb, tachinids can be identified by their hairy and/or colorful abdomens. Robber flies remain interesting to the insect enthusiast based on the fact that they are one of only a few predatory fly families that feed on other insects. One of the first tips for identifying robber flies is to be on the watch for them as they perch in an area of their territory, waiting for insects to approach. Once prey is spotted, they attack, using their proboscis to inject a neurotoxin into the prey. With around one thousand different species of Robber Flies (family Asilidae) in North America, there is a good chance you will find at least one species in your area. Generally robber fly appearances show similarities from species to species. Primarily they are large, aggressive flies with thin, long bodies. There are some exceptions, with a few species having a more rounded appearance and resembling bumblebees. Their ability to paralyze prey allows them to hunt for relatively large insects such as grasshoppers and dragonflies. Fortunately their aggressive behavior does not extend to humans, making it easy to approach them and watch their behavior. Soldier Flies belong to the family Stratiomyidae. They come in a variety of colors, often with stripes or multi-color abdomens. Many species resemble bees or wasps. 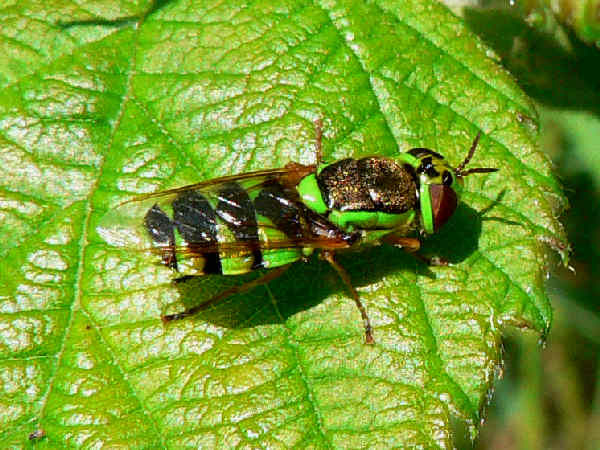 This green soldier fly in the picture looks almost good enough to eat. That’s probably not a good idea because they sometimes feed on manure. They are not considered pests. Long legs and thin bodies make crane fly species (family Tipulidae) fairly easy to identify at the family level. With approximately fifteen hundred North American species, moving beyond identification at the family level can be problematic. While species vary in size, some of the larger species (over two inches in length) also rank as the world’s largest flies. 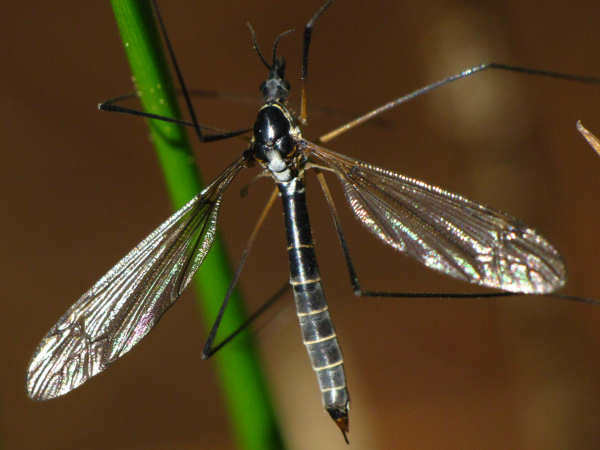 Crane flies go by a variety of nicknames, including mosquito hawk, although adults do not feed on mosquitoes. They also do not bite humans. In some areas they are called daddy long legs.